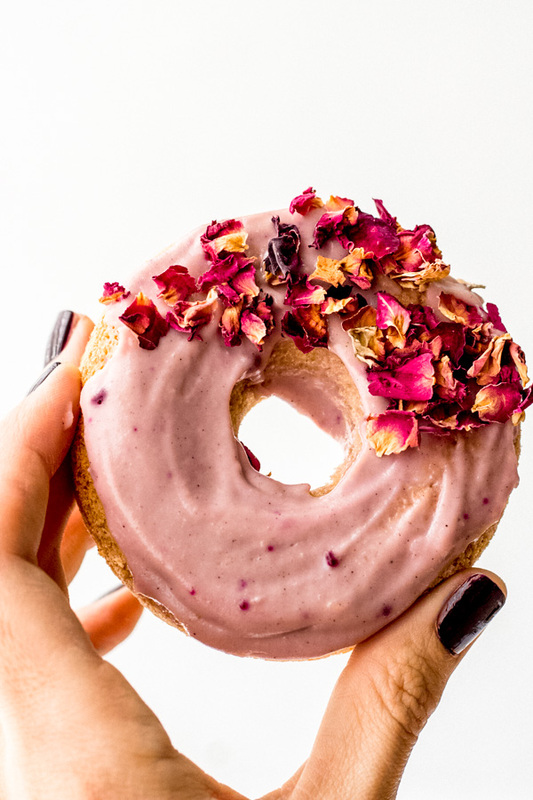 Who doesn't love a good (vegan) donut? 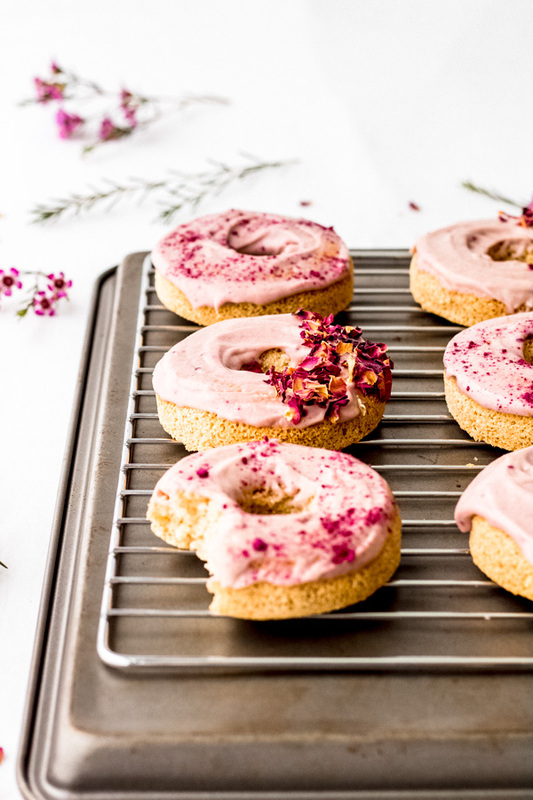 I decided to make these pretty and pink vegan cake donuts just in time for Valentine's Day, because can you ever really go wrong with donuts? So a few weeks ago I started learning more about the 'science' behind gluten free baking, and baking in general really. I am by no means a professional at this stuff.. but I do love to experiment in the kitchen, learn the rules (and break them), get creative, and then share all this fun stuff with YOU. That IS why I fell in love with cooking in the first place - vegan cooking allowed me to get creative in ways that I hadn't before... it forced me to use different ingredients and come up with non traditional ways to make traditional foods. 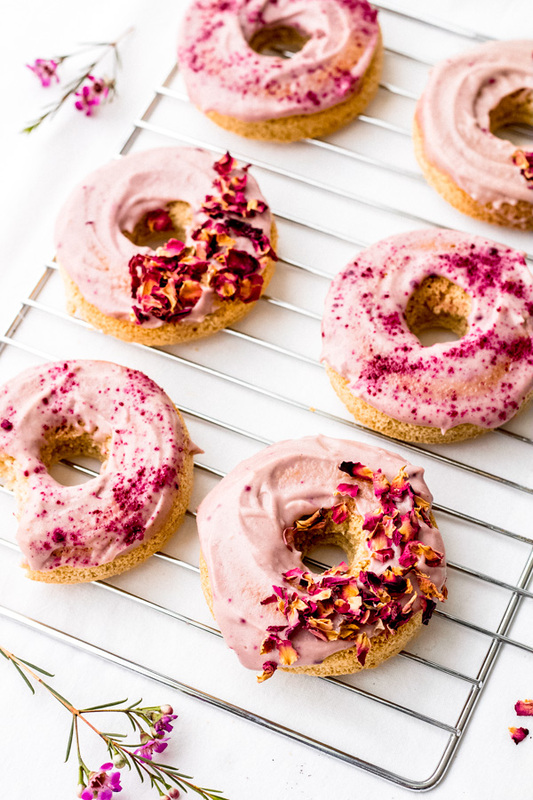 Anyway, enter these rosy pink vegan cake donuts. Now I won't say these are exactly the soft, airy, and chewy kind that you can find at Dunkin' Donuts - because that would be a lie. But these are pretty darn good - and plant based, oil free, refined sugar free, and made with wholesome ingredients! They do contain oat flour so I won't call them gluten free - but if you feel safe using certified gluten free oats then you cannn technically make these gluten free as well if needed. there is a lot of debate as to whether or not certified gluten free oats are truly (and safely) gluten free so I'll leave that up to you. and a pinch of salt for good measure. coconut butter - NOT the same as coconut oil. If you are wondering why there are so many different types of flours (I use to wonder the same thing before I learned) - the reason behind this madness is that each flour brings a different characteristic to the table. Without the coconut flour we'd be missing out on good healthy fats that help bind everything together. Without the potato starch things would probably get really really dry and gummy because of the oat flour. 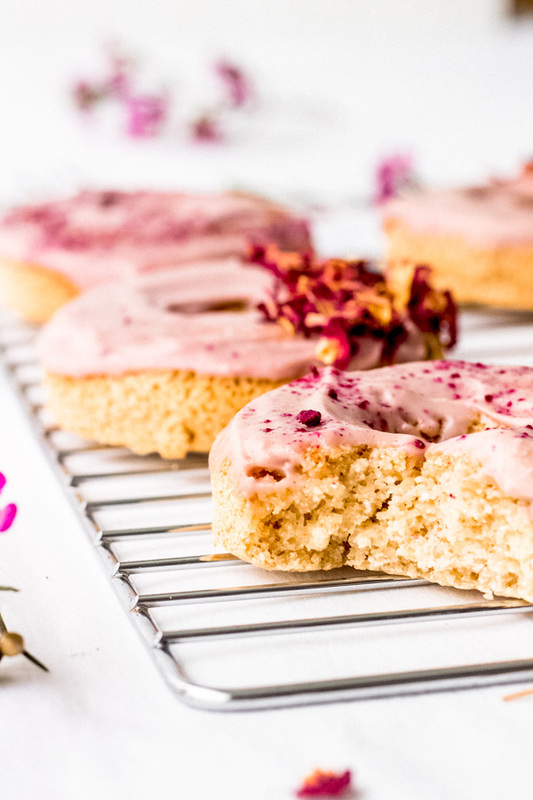 The final result is a delicious and sweet, sort of chewy and soft donut that is sure to please any vegan you know. These are best enjoyed the day of, but still taste amazing the next few days although they will be much denser (less soft) than on day one. The pink frosting on top is probably my favorite part of this all. It's made mostly with soaked cashews and pink dragon fruit powder (freeze dried raspberries will probably work too). 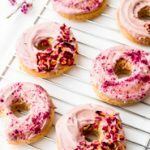 In order to keep things oil free I use a non stick silicone donut mold (affiliate link) which works great in this recipe because NONE of my donuts stick to the pan!! If you do not have a non stick silicone mold - you can always lightly spray your mold with a bit of coconut oil to keep things from sticking. Another important tip is to make sure you let the donuts really cool after baking before removing them from the mold. The donuts will be superrr soft right out of the oven. As they cool, they will continue to harden - so be patient! Allright foodies - that's all for today. Hope you enjoy this recipe and HAPPY VALENTINE'S DAY!!! Want to see more vegan valentine's day recipes? In a mixing bowl, combine all dry ingredients – oat flour, potato starch, coconut flour, baking powder, and salt. Add wet ingredients to the dry bowl and mix to combine. The mixture will be similar to pancake batter. It should not be dry – it should be pour-able. Pour the donut batter into a large silicone donut pan (affiliate link – if not using silicone, you might have to spray the pan with nonstick spray). I use about 1/3 cup for each donut – make sure to leave a little bit of space in each mold because donuts will rise. Bake donuts at 350 for 30 to 35 minutes. Remove from oven and let them cool down before removing from pan. Donuts will be extremely soft right out of the oven – that is expected. They will continue to harden as they cool down. Once they are cool enough that you can remove them from the pan without breaking them – let them cool down further on a cooling rack. 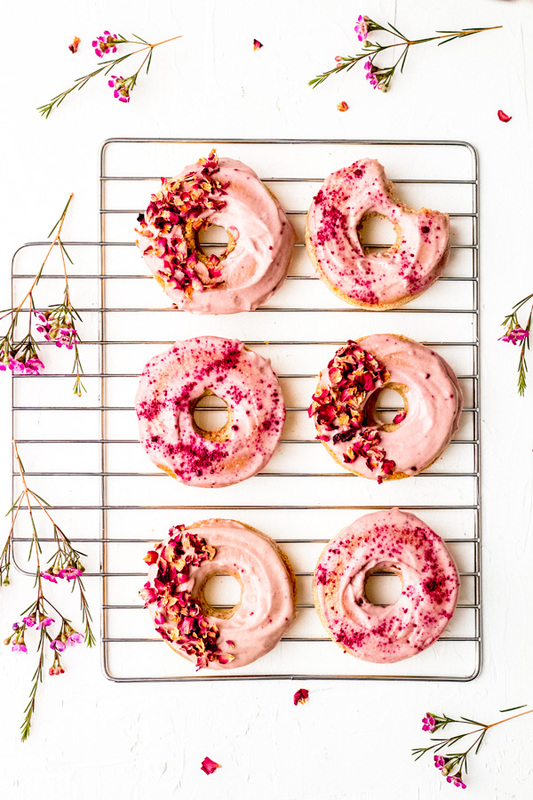 Once donuts are cool to the touch, spread pink frosting, and top with edible pink flowers or sprinkle extra pink powder on top for decor purposes. You can also drizzle coconut butter on top for extra yumminess. Donuts are best enjoyed the day of. They will become more dense in the fridge. If you don’t like them super dense, you can let them sit out before serving and they will soften up. 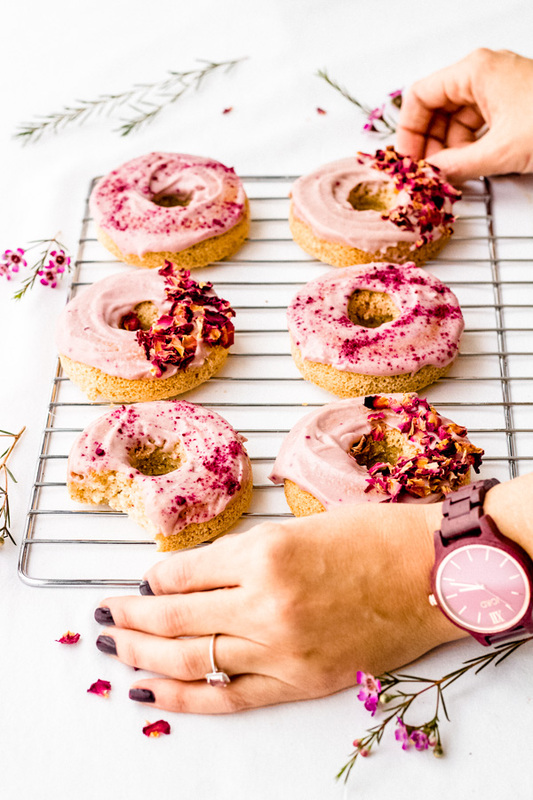 As I mentioned above – I use a silicone donut pan (affiliate link) which makes it really easy to remove donuts without having to use a nonstick spray or oil.. however if your pan is rigid you may have to spray it with a bit of nonstick spray. If you change any of the flours mentioned above it will totally change the outcome. 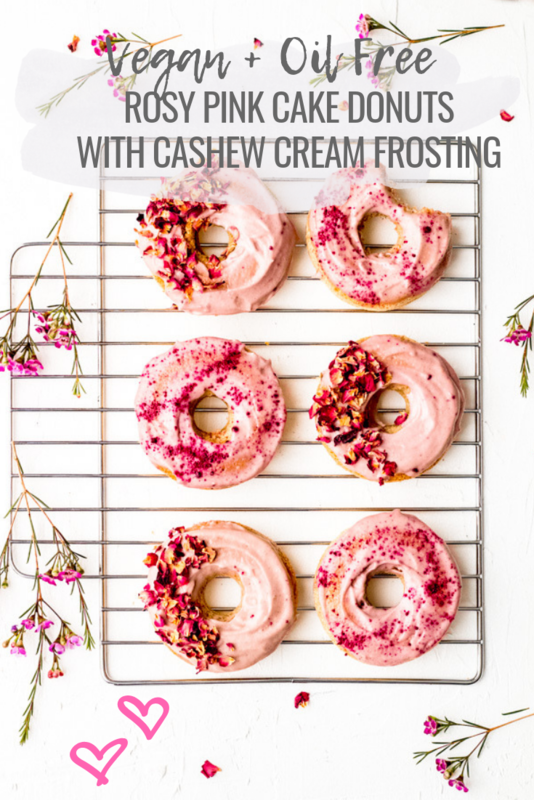 I use a vitamix but i still soak the cashews for an hour because since this is a ‘frosting’ i want it to be really creamy and not watered down – so in order to use the least possible amount of milk, the cashews need to be nice and soaked. If you don’t have a powerful blender, i would suggest soaking the cashews overnight to be safe.